It is great to have an iPhone. It is. With a new era of communication and connectivity, the existence of a device relating us to others is inevitable. When it comes to a phone with a lot of function and application, sometimes I can not help but thinking that this double-edged sword, with its addictive nature that makes me bound to it, is such a guilty pleasure and a wisdom test object. And all of this, was started by BlackBerry. First, I avoided using BlackBerry because I hated the fact that all of my friends were chatting on BlackBerry messenger on our table dinner. Even though they could easily talk behind my back with literally being present, right in front of my nose, I didn't want to be part of them. Then I gave up. The long period of addiction began. And as so in other addiction, one you got hooked, there's no easy way to turn back. Or worse, it's getting deeper. 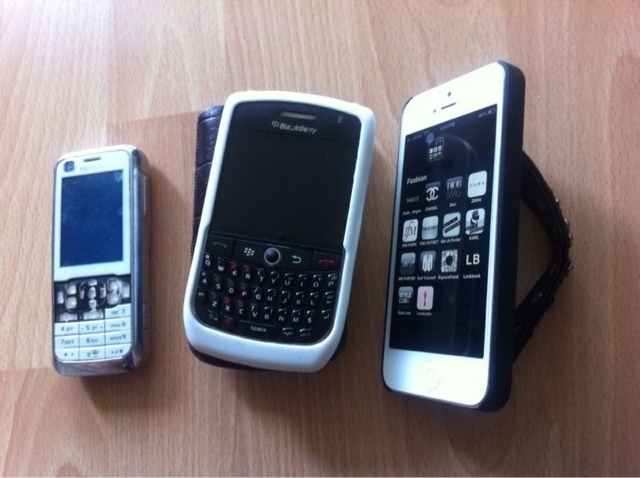 But what I like about BlackBerry was that it drew me close to far-distance family and friends. Well, it was like bring close the far, and dissociate the close. ALL of Indonesian back then had it, even my mum's driver. When he asked me one day when I was home, what my BB pin is, I was like, "What? You use BB? I don't!". Jeez. One of friends said to me, "Welcome to the civilization" when I eventually got it.I knew Twitter from BB era. I had push email for the first time to it as well. I never typed a text faster than ever--I hate touch screen, still. I miss keypads so bad. Compared to my old Nokia (Oh it's older than god, with all of the navigation pads are gone. But the battery life was incredible. It lasted a week or so), BB had been a friend. A separated physical organ. It was the first thing I touched in the morning. I was worried if the battery bar was dying. I was like a child lost in a big mall if I incidentally left it home. I bought it an alligator leather case. It was everything. And yet, as other thing in life, there is an end. Now with whatsapp and line and kik and everything else, BBM, the most important feature on BlackBerry, is replaced. Thank you, Blackberry. You not only introduce me to the crazy savvy world, but you also have nurtured me to be wise using your competitors, and instead of getting hooked by it, I hooked many opportunities people out there offer. I want to say good bye.